Nicholas Murray Butler (April 2, 1862 – December 7, 1947) was an American educator, philosopher, and diplomat, an advocate of peace through education. The co-winner with Jane Addams of the 1931 Nobel Peace Prize, Butler served as president of Columbia University (1902-1945), and president of the Carnegie Endowment for International Peace (1925-1945). His vision for education, which he saw as the foundation of successful society, was of high academic standards, the intellectual pursuit of knowledge, and training in character. Under his leadership, Columbia became a world renowned university. Butler was concerned not only with American society, but invested much energy in work toward peace in the world, regarding education as key to the establishment of international peace. 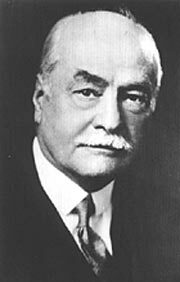 Butler was born on April 2, 1862, in Elizabeth, New Jersey, to manufacturer Henry L. Butler and Mary Murray Butler, daughter of Nicholas Murray, a clergyman and writer. He enrolled in Columbia College (which became Columbia University in 1896) and earned his B.A. degree in 1882, his Master's degree in 1883 and his doctorate in 1884. Butler's academic and other achievements led Theodore Roosevelt to call him "Nicholas Miraculous" (Rosenthal 2006). In 1885 Butler studied in Paris and Berlin and became a lifelong friend of future United States Secretary of State Elihu Root. Through Root he also met Roosevelt and William Howard Taft. In the fall of 1885, Butler joined the staff of Columbia's philosophy department. In 1887 he co-founded and became president of the New York School for the Training of Teachers, which later affiliated with Columbia University and was renamed Teachers College, Columbia University. He married Susanna Edwards Schuyler, and had one daughter from that marriage. Throughout the 1890s Butler served on the New Jersey Board of Education and participated in forming the College Entrance Examination Board. In 1901 Butler became acting president of Columbia University and in 1902 formally became president. United States President Theodore Roosevelt attended Butler's inauguration. Butler remained president of Columbia for 42 years, during which time the university expanded its campus, erected a number of new buildings, and added several new schools and departments. Among the innovations he oversaw was the opening of the Columbia-Presbyterian Medical Center, the first academic medical center in the world. However, the dark side of his presidency was that he worked to limit the admission of Jewish students to the university, and to prevent the election of Jews to the Board of Trustees. Butler’s wife Susanna died in 1903 and he remarried in 1907, to Kate La Montagne. Butler’s political ambitions become obvious already early in his career. He was a delegate to each Republican National Convention, from 1888 to 1936. In the presidential election of 1912, Butler received the eight vice-presidential electoral votes that would have gone to Vice-President James Sherman, who had died shortly before the popular election. In 1916 Butler failed in an effort to secure the Republican presidential nomination for Elihu Root. Butler himself attempted unsuccessfully to secure the Republican nomination for president in 1920 and 1928. Butler became disillusioned with the negative effects he believed the 1920 national prohibition of alcohol was having on the country. He became active in the successful effort to bring about the repeal of prohibition in 1933. Butler became the chair of the Lake Mohonk Conference on International Arbitration that met periodically from 1907 to 1912. In that time he was appointed president of the American branch of International Conciliation. Butler was also instrumental in persuading Andrew Carnegie to make the initial investment in the Carnegie Endowment for International Peace. Butler became head of international education and communication, founded the European branch of the Endowment headquartered in Paris, and was president of the Endowment for 20 years. Continuing the clear sense that he was trusted by the many internationalists in power, Butler was made president of the elite Anglo-American integration society, the Pilgrims Society. He served as president of the Pilgrims from 1928 to 1946. Butler was also president of The American Academy of Arts and Letters from 1928–1941. Butler served as president of Columbia until 1945. When he became almost blind in 1945 at the age of 83, he resigned from the posts he held and died two years later. He is buried at Cedar Lawn Cemetery, in Paterson, New Jersey. Butler was known as a hard working man. He graduated from high school at the age of 13, and obtained his Ph.D. at 22. At 23 he joined the staff of Columbia University. Wherever he went and whatever he was doing, he always wanted to be the best and to achieve the most. He wrote and spoke voluminously on all manner of subjects ranging from education to world peace. Besides teaching on various subjects, education should also keep the tradition of disciplining the character. He said: “There are many things that go to make up an education, but there are just two things without which no man can ever hope to have an education and these two things are character and good manners.” Education thus had a role to shape both people’s intellect and their character. He held that educated people are necessary for world peace. He firmly defending the “great tradition” of humanism in education, and criticized pedagogical reforms, vocationalism, and over-specialization in education. Butler proposed that universities introduce a standardize method of college admissions. His initiative was applied in a form of the College Entrance Examination Board, which limited entrance to higher education to the intellectual elite. Because of that, many critics objected that Butler was an elitist. His autobiographer, Michael Rosenthal (2006) wrote that Butler liked democracy "so long as it didn't interfere with the freedom of a small cadre of the right people to run things." He was famous as an extremely controlling person, always wanted to be “on top of everything.” He supported academic freedom in theory, but during both world wars he required all Columbia faculty absolutely support the war effort. Butler not only promoted the merging of education and politics in order to achieve world peace, but also actively participated in efforts to bring that peace. He was the head of the Carnegie Endowment for International Peace. It was Butler who proposed to Frank Kellogg the idea for the Kellogg-Briand Pact, and who actively supported that pact for years. Kellogg-Briand Pact, which was signed on August 27, 1928, was an international treaty that renounced war as an instrument of national policy. For his promotion of the Pact Butler received the Nobel Peace Prize in 1931. Butler's critics objected that he was too naïve, putting too much focus on rhetoric and organization of numerous peace conferences, and too little on “real problems” in the world. His critics also objected that Butler supported fascist movements in Europe, and for hosting a German ambassador at Columbia shortly after the Nazis came to power in 1933. The dark spot in Butler’s career was his attitude toward Jews. Although not overtly anti-Semitic, Butler had conflicted and complex feelings about Jews. On the one hand, he had great respect for many Jewish individuals, especially in the upper reaches of the sciences, law, and academia. Thus, it was during his tenure that Lionel Trilling became the first tenured Jew in Columbia's English department. Butler was also repulsed by crude displays of anti-Semitism. When the University of Heidelberg protested Butler's selection of a Jewish delegate to represent Columbia at Heidelberg's 550th anniversary celebration, Butler indignantly replied that at Columbia, delegates were selected on the basis of merit, not race. On the other hand Butler kept discriminatory policies against Jews. For many years of his presidency, Columbia had a strict quota limiting the number of Jews who could attend the school. Butler was president of Columbia University for 43 years, the longest tenure in the university's history. He doubled the size of the campus and increased the student body from four thousand to 34,000. Columbia later named its Butler Library building and a faculty apartment building in Butler's honor, along with a major prize in philosophy. In 1931 Butler won Nobel Prize for his achievements in the area of international peace, especially in connection with the Carnegie Endowment for International Peace. His work on the College Entrance Examination Board and his advocacy for the establishment of a standardized entrance exam is present today in a form of different exams required for prospective students to enter universities. Butler's name was so widely recognized and his influence so great that he was able to deliver a Christmas greeting to the nation every year in The New York Times. During his lifetime he received 37 honorary degrees, 13 memberships of foreign societies, and 17 decorations from foreign countries. His work, however, is seldom discussed today, and his name has generally fallen into oblivion. Butler, Nicholas M. 1918. A world in ferment: Interpretations of the war for a new world. Charles Scribner's Sons. Butler, Nicholas M. 1924. The faith of a liberal: Essays and addresses on political principles. Charles Scribner's Sons. Butler, Nicholas M. 1928. The meaning of the U.S. constitution. Haldeman-Julius Publications. Butler, Nicholas M. 1934. Between Two Worlds: Interpretations of the age in which we live. Charles Scribner's Sons. Encyclopedia Britannica. n.d. Nicholas Murray Butler. Retrieved December 16, 2006. Haberman, Frederick W. 1972. Nicholas M. Butler. In Nobel lectures: Peace 1926-1950. Amsterdam: Elsevier Publishing Company. Retrieved December 16, 2006. Marrin, Albert. 1976. Nicholas Murray Butler. Twayne Publishers. Marshall, Edward. 1914. The United States of Europe: An interview with Nicholas Murray Butler. Carnegie Endowment for International Peace. Thomas, Milton H. 1934. Bibliography of Nicholas Murray Butler, 1872-1932. Columbia University Press. Whittemore, Richard. 1970. Nicholas Murray Butler and public education, 1862-1911. Teachers College Press. History of "Nicholas M. Butler"
This page was last modified on 21 November 2018, at 22:06.